If you struggle with the mess and time it takes to make salads like I do, Mason jar salads can certainly help you get in more leafy greens. Pick up a few inexpensive, quart-size Mason jars—they’re portable and keep those veggies fresh for days. The secret to Mason jar salads lies in the layering. When layered properly, they can last three to four days in the refrigerator, which means you can prep a week’s worth of salad, complete with dressing, at once. One quart-size Mason jar salad makes a satisfying meal for one or a convenient side salad for two. This Southwestern grilled chicken Mason jar salad has quickly become one of our favorite, make-ahead meals this summer. Featuring grilled chicken, fresh corn, bell peppers, black beans, juicy tomatoes, diced red onions, crisp romaine lettuce and crushed tortilla chips, this mealworthy salad is packed with protein and fresh veggies and has the perfect amount of crunch. The yogurt-based avocado crema dressing is addictive and doubles nicely as a dip, so do yourself a favor and make a double batch. 1. Don’t bother cooking your corn. Gnawing on a raw ear may seem a little weird, but a good ear of fresh corn doesn’t need to be cooked! Save yourself the time and trouble. To cut down on cleanup time, cut kernels off in a mixing bowl. Place a mixing bowl on top of a damp kitchen towel. Then lay a damp paper towel in the mixing bowl—this will prevent the ear from slipping. Place one end of the corn on the paper towel and carefully slice the kernels off into the bowl. Rotate and repeat until all kernels have been cut off the cob. 2. Sub store-bought grilled or rotisserie chicken. No grill? No problem! You can cook your own chicken breast in a skillet on the stove, or take the easy way out and pick up some precooked chicken breast at the grocery store. Frozen grilled chicken breasts or fresh rotisserie chicken both work great! 3. Leave your cilantro on the stems. Picking cilantro off the stem is an incredibly tedious task—but for the delicious crema dressing, it’s completely unnecessary. Just slice the bottom inch off a fistful of fresh cilantro and toss it all in the food processor! Add all ingredients to a food processor and process until smooth, about 30 to 45 seconds. Transfer to a dressing jar or small pitcher and set aside. Store leftovers in the refrigerator for up to 3 days. Divide salad ingredients among the four Mason jars in the order listed to optimize freshness. To each, add 3 tablespoons dressing (more if you made a double batch and like a well-dressed salad), ~⅓ cup raw corn kernels, ~¼ cup chopped bell peppers, ¼ cup black beans, 2 to 3 tablespoons diced red onions, ~⅓ cup quartered grape tomatoes, 4 ounces chopped chicken breast (about 1 cup) and 1 cup chopped romaine lettuce. For salads that will be stored in the fridge and eaten later, keep tortilla chips fresh by making tortilla chip packets for each, wrapping crushed tortilla chips in plastic wrap or aluminum foil. Place packets on top of the lettuce and screw on lid. Store salads in the refrigerator until ready to enjoy. Salads should keep up to 3 days in the refrigerator but are best within 1 to 2 days. When ready to eat, simply pour ingredients into a bowl, toss well and enjoy. 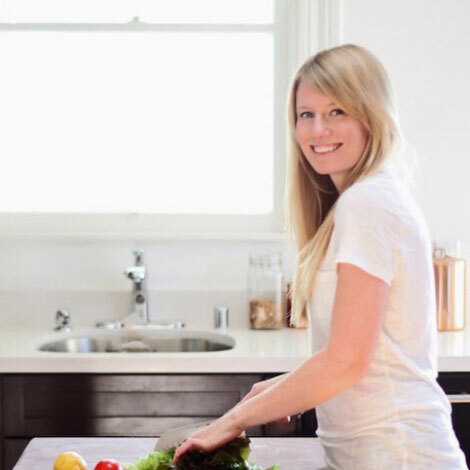 Elle Penner is a registered dietitian and former lead dietitian at MyFitnessPal, turned full-time writer, recipe creator, photographer, blogger and mama. Her favorite things include her camera, carbs, sweaty workouts and her son.